It has been written and said so much on the Native Americans, but few know that they were a people without barriers. In fact, in their language the word “disability” and the concept related to it did not exist. Within the Indian communities the “different” were identified with the term Heyoka, those who, having received from God the gift of diversity, knew how to understand the needs and emotional state of people by exploiting an innate empathic sense. For this reason, the Ability Channel team, thanks to their experience and always being committed to support the concept of positive disability, has created the Heyoka platform, a place without barriers, a community that offers experiences to help improve and make it even better. The information about the world of disability is more incisive, also offering services, opportunities and advice that go beyond the disability itself. The spearhead of the platform are the Heyoka of our days, boys, women, athletes, para-olympic champions and professionals who with their experience incite people accompanying them in their path of integration and emancipation and supporting them in the realization of dreams and projects. 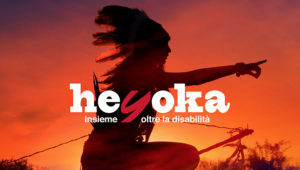 The Festival has crossed roads with Ability Channel, a portal dedicated to the world of disability, that launched this high-involvement initiative, the HEYOKA project. It is a community founded to share stories of courage and experiences of comprehension, freedom, honor, adventure and beauty. Stories that start from disability, from diversity, and reach in to everyday life to change the perspective of the world through a different point of view. The two teams are sure that by joining forces the message will have a greater impact and a great power of penetration to positively influence the world of disability. Of all the works received for the USR Film Festival, the jury of the HEYOKA Award (Native American term to indicate who had received from God the gift of diversity and that could sense the soul of people through empathy.) 6 works have been selected that respond to the theme of empathy and inclusion. The award ceremony will take place in the final evening of 3 February at the Casa del Cinema in Rome (free entrance until end of seats), but the 6 works in competition will be previewed on Thursday 31 January during a special screening at the Istituto Roberto Rossellini in Rome with the participation of the authors and Heyoka team.